Spiders are an amazingly diverse group of animals, the eighth most diverse group of animals of the planet in actual fact. It doesn’t take long while poking around in the undergrowth to come across a spider. Some build webs and some don’t but they can all spin silk, the orb weavers having the ability to spin upto seven different types of silk. The non-orb weavers tend to be ambush predators, remaining motionless in a strategic location where potential prey may wander innocently by unaware of the imminent life threatening danger. The ambush position could be on the side of a wall, atop a leaf or sitting on a flower head. This Wandering Spider, (Cupiennius sp), was sitting perfectly still on a blank white wall at night. As many spiders are nocturnal predators the eyes play a lesser part in the identification and capture of a meal but that does not imply the spider is without the means by which to locate the exact location of its prey. The body, which at first sight looks smooth, upon closer examination can be seen to be covered in hairs of different lengths. These hairs form part of a battery of sensitive sense organs responsive to touch, vibration and moving eddies of air currents that allow the spider to detect a passing meal in the darkness. The majority of hairs covering the body, which give most people the heebie-jeebies with regards to spiders, are tactile and touch sensitive, the stimulus of which will cause the spider to attack or run away. Between the shorter hairs, particularly on the legs are long fine hairs called trichobothria. These are super sensitive to the slightest movement in air currents which can be a giveaway for any larger creature passing by which could make a nice meal. The Wandering Spiders can even detect insects such as moths flying overhead which they jump and grab straight out of the air. For those more stealthy prey items whose movements are too slow to disturb the air, they cannot avoid causing small vibrations of the substrate and the spiders are attuned to this also. Around the body but more particularly around the leg joints are slit sense organs which allow the spider to detect any vibrations moving through the substrate upon which it is placed. Whereas the Wandering Spiders rely on their tactile senses at night during the day there are spiders that actively hunt down their prey visually. The Jumping Spiders prefer to hunt in full sun. The most obvious feature are the large anterior eyes with which they can locate and subsequently stalk their victims. They stealthily approach to the point where the potential meal is within striking distance. The spider braces itself and then pounce. The fangs are embedded upon impact, pumping venom into the victim which is held in a death grip by the front pair of legs. The spiders may be highly adapted carnivores with specialized hunting techniques but they too in turn have predators specialized to catch and eat them. Not the least of these are the giant Helicopter Damselflies, (Megaloprepus caerulatus), the largest damselflies on the planet. They can be seen flying along the sunlit trails through the forest. The peculiar motion of the blue/black tipped wings gives the impression of rotating helicopter blades. What may at first seem like a somewhat erratic flight pattern actually has design. The more astute observer will notice that they have the ability to fly vertically up and down as well as horizontally in and out. But what are they seeking? The large eyes and acute vision are scanning spider webs in front of which they momentarily hover scanning for the silken structures builder. Once located the spider is grabbed in the legs of the damselfly which goes into reverse gear before biting off the spiders head and legs to finally gorge itself on the soft body parts. The damselflies can be recognized when they alight by the habit of folding the wings together over the body. Their cousins, the dragonflies keep the wings held out to the sides when at rest. During the day it is not too often that they do rest. Each individual has a perch from which it frequently takes off to investigate any passing creature that might make a meal or another dragonfly that might prove to be a mate or another dragonfly that might be a rival for that meal or mate. They make aerial sorties swooping at speed, hovering in place and if unmoved to action return to the perch for a short while before they are off again on another sortie. They differ from the more delicate damselflies not only by how they hold their wings but also in the structural placement of the eyes. Damselflies have two large compound eyes widely separated on either side of the head. Dragonflies have two large compound eyes that meet together for a greater or lesser part of their margins on top of the head. However no matter where the eyes are placed they allow for excellent diurnal vision which combined with the unsurpassed aerobatic proficiency make these some of the masterful airborne hunters. As we move into the dry season the hot and parched conditions stimulate many of the plants into flowering. This is most certainly true of the orchids. There are two orchids that can be seen blooming at the moment in the area. One is a non native terrestrial orchid, the Bamboo Orchid and the other is a native epiphytic orchid. The Bamboo Orchid is a native of South East Asia but is planted in many parts of Costa Rica as a beautiful ornamental edging plant. Bamboo refers to the long erect stalk that resembles that a of a bamboo grass. The attractive purple flowers appear throughout the year giving a nonstop display of color for the back of a flower border. The majority of orchid species in Costa Rica are epiphytic, that is they grow on the outside of trees without harming them. Generally to see orchids you need to be at the top of the canopy, 88% of Costa Rica’s 1400 orchid species are to be found there. Many of the orchids flower from December into January but some may be seen flowering at any time of the year. This particular specimen was found growing close to the ground near the base of a large tree. Due to the diversity of genera and species the identification of orchids, like so many tropical plant and animal taxa, is the realm of specialists. 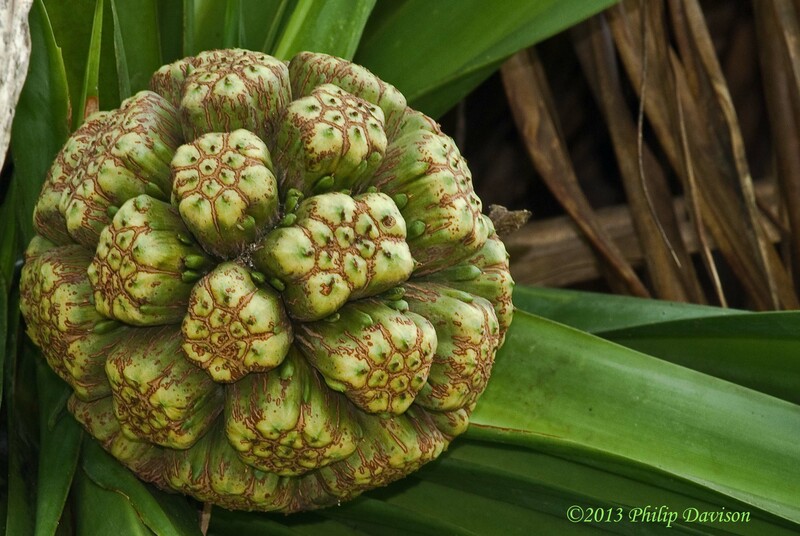 For most visitors it is enough to see and enjoy the exotic blooms should you be lucky to encounter them. The dry season at Bosque del Cabo Rain Forest Lodge always experiences a stuttered beginning. The lodge is located on the south west tip of the Osa Peninsula, Costa Rica overlooking the Pacific Ocean to the south and the Golfo Dulce to the east. The region is covered by some of the last remaining tropical forest on the Pacific Coast of Central America. Due to the pronounced seasonality of the area having a profoundly dry five months followed by a wet seven months the forests here are more correctly classified as tropical seasonal forests as opposed to tropical rain forests which are not subject to the annual dry period. The heaviest rains of the year fall between September and November. By December the daily deluge abates and we gradually see more of the sun. It is easy to be lulled into a false sense of “the summer is here” as commonly a few dry, bright days with blue skies will be followed by another week of torrential downpours. But eventually the faltering weather passes through the transitional phase and settles into a more predictable pattern. Given a few weeks of steady, dry heat and the plant life will begin to flower. The number of butterfly species and individuals that had dropped in the wet season begins to build once more so the days are now filled with beautiful, brightly colored wings adorned in poster reds, yellows and orange dancing around the flower heads. There is never a shortage of mammal or bird sightings. Currently there are many migratory warblers and tanagers chattering noisily in mixed flocks as they move from tree to tree in search of insects or fruit to eat depending on their specific diet. The resident bird populations do not mind those long distance travelers returning to spend the winter in the warmer climes of the tropics and join quite readily with their travelling cousins in large flocks. Monkeys abound in the trees, constantly on the move looking for food whether it is flowers, young leaves, fruit or insects. Under the trees the large ground living rodents, Agoutis, feed on the fallen fruit and large heavily coated seeds. Solitary male White-nosed Coatis are on the lookout for anything they can get their paws on; grubs, crabs, bird’s eggs and chicks as well as fruit or discarded food in the bins of the restaurant. The gregarious females with young patrol in large foraging packs looking for the same food as the males but not with the same bold abandon. The peace of the hot still sultry afternoon atmosphere is occasionally permeated by the call of a mammal or bird. The ever active Spider Monkeys let out a series of high-pitched shrieks which sporadically turn into a hysterical frantic screaming match. From deep in the forest the doleful Howler Monkeys bark and roar their disapproval of some irritation. The White-faced monkeys oblivious to the presence of human observers chitter and chatter amongst themselves. Coming from the surrounding vegetation are the chirps and cheaps of the warblers and tanagers. But for the most part the soporific pulsating heat and the throbbing silence serve to create a languid attitude for visitors to the tropics. All of a sudden the siesta is interrupted by a harsh ear-piercing screech. Several birds of prey inhabit the area and neither the hawks nor the falcons have been blessed with a melodious call. Commonly seen sitting at the top of the palms or on the ground are the Yellow-headed Caracaras, (Milvago chimachima). Despite their raptorial appearance these elegant members of the falcon family are generally carrion feeders. They can also be seen riding the backs of cattle feeding on bovine ticks. Due to their association with cattle they are commonly seen in open pastureland. Until 1973 they had not been recorded in Costa Rica but following widespread deforestation their distribution and geographical range spread north from Panama into Costa Rica and they can now be seen in Nicaragua. That nasty nasal screech was an adult Yellow-headed Caracara calling from on the ground but there was another call, similar yet more urgent. Not too far from the adult was a newly fledged youngster that was making its first foray from the nest. It had not yet mastered the art of flight and was demanding food from the parent bird that was watching warily over its offspring’s pitifully laborious progress hopping and jumping across the ground. The brown speckled shabby looking youngster bore little resemblance to its sleek yellow-faced dark-browed parent standing guard over its precarious and vulnerable position. Another bird seen either high or low is the Turkey Vulture, (Cathartes aura). As you look up into the deep blue tropical sky it is likely that you will see flocks of birds soaring on the thermals. Silhouetted against the azure background the shapes and shades circling above you will help discern the different species present. Long thin wings bent back from the center like a Batman motive combined with a forked tail easily characterize the Magnificent Frigatebird. A huge bird with broad, wide wings fingered at the end and divided into a monochrome white leading edge and black trailing edge leave no mistake that this is a King Vulture. Similar in shape but uniformly dark except for grey fingered tips is the Black Vulture. Soaring with them with the same wing form but with longer tail and complete grey trailing edge is the Turkey Vulture. On the ground there is no mistaking the Turkey Vulture for its head bare of feathers is bright red. Like the Yellow-headed Caracara the Turkey Vulture feeds on carrion but unlike its falcon cousin which locates food visually, the vulture has a highly developed olfactory sense and can locate the chemical signature of decomposition following the plume of molecules of death to their source hidden beneath the forest canopy. They can often be seen beneath the palm trees feeding on the fallen palm fruit. Vultures are not everyone’s favorite bird but they play a vital ecological role in disposing of rotting carcasses and rubbish that won’t make to a landfill site. Sitting beneath the palm trees in the company of vultures one will more often than not see Agoutis, (Dasyprocta punctata). 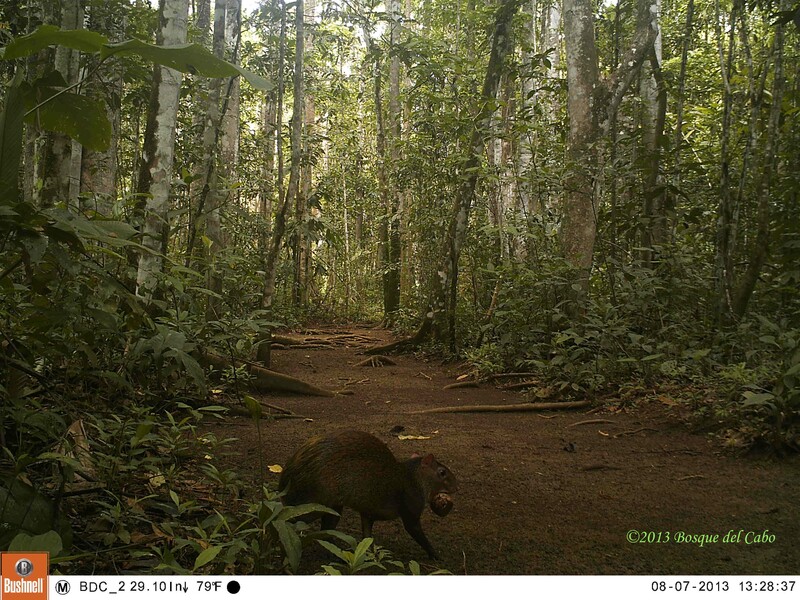 These large ground living rodents are related to Capybaras, Coypus, Pacas and more familiarly Guinea Pigs. Along with the vultures they are waiting for the palm nuts to fall. Agoutis are essentially seed eaters and have the ability to sit back on their haunches while holding the seed in their front paws which they can manipulate and turn allowing them to easily gnaw through very tough seed coats such as nuts. At the moment there are a lot of fruits on the grapefruit tree which when ripe fall. Eagerly awaiting this softer option dropping from above there are some Agouti individuals that pick up the sizable citrus prize in their mouths and carry it off to be eagerly consumed. They do not eat the peel but rather the soft juicy segments inside. Whereas during the day vultures and Agoutis can be seen frequenting the palm trees at night it is possible to see another creature that utilizes the palms. If you look a little more closely at what might seem like old and dropping palm fronds you will see that they will have had another force at work. Something has nicked through the veins of the frond to be point where it folds over. Take a look inside and there you will most likely find the culprit responsible for this chiropteran topiary – the Tent-making Bats, (Uroderma bilobatum). The Tent-making Bats use the tents as either day roosts or night roosts. If they are using them as a day roost there can be as many as forty bats hanging under the frond. They regularly change the location of each roost they are using as predators would quickly figure out where to get an easy meal. One of the commonest predators of the tent making bats are the Squirrel Monkeys. During the day they identify which roosts are being used by the bats climb to the fronds above and then drop onto the roost. The startled bats come fluttering from underneath where they are picked off by the monkeys. Currently they are being used as night roosts. Once the sun has set the bats leave the day roosts and fly to the selected night roosts where they wait until it is very dark before they go foraging for food. The Tent-making Bats are fruit-eating bats and use night roosts which are never more than 80 – 100 meters away from the nearest fruiting trees which in this area are figs. The carry the figs in their mouths back to the night roosts whereupon landing they then hold the fruit between their wings, peel off the skin with the teeth and eat the pulp. Just before the sun rises they leave the night roosts and return to the day roosts where they will pass the day sleeping. Weatherwise the past week has been one of sunshine and showers. The week started wet but as we progressed through the days then the sun became more and more of a feature until finally over the weekend the days were warm and cloudless. We even managed a few nights without rain. The rain that did fall was not too heavy, just enough to keep things moist and help maintain a flow of water in the creek. Over recent years there has been a downturn in the fortunes of the White-nosed Coatis, (Nassua narica). Their numbers fell precipitously and for a period of several years the individuals that were seen appeared to suffering some sort of disease. Their fur was sparse and mangy-looking and their demeanor seemed lethargic and lacking their normal inquisitive vitality. 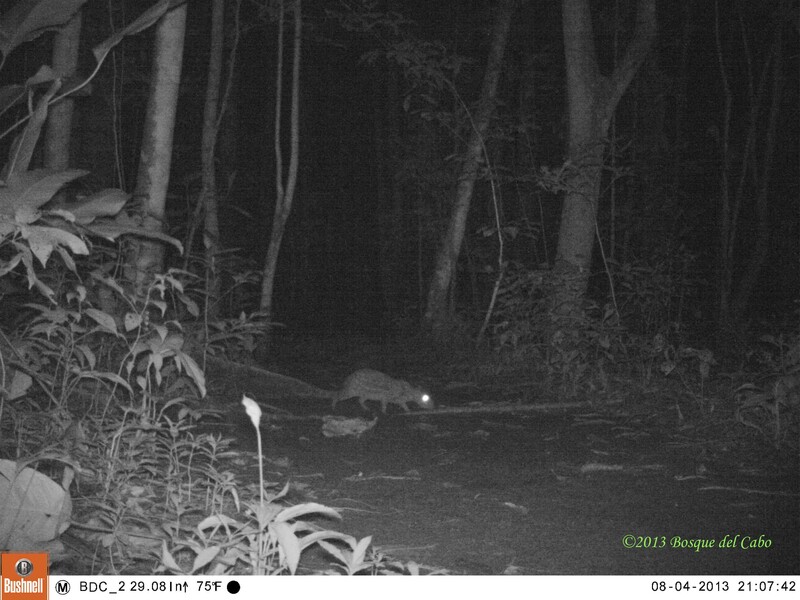 Last year the males, which are solitary, (the name of a single male coati is Coati Mundi), were back sniffing around the grounds in search of whatever they could find. This year the grounds have been home to roaming bands of gregarious females with a plethora of young in attendance. It would seem that whatever malady had apparently been affecting them seems to have run its course and now people can see them with relative ease on most of the trails. The Australian Screw Pines, (Pandanus sp), have been fruiting recently and it is not uncommon to see one the male White-nosed Coatis at the top of the plant ripping the exotic pinecone-looking fruit to pieces. 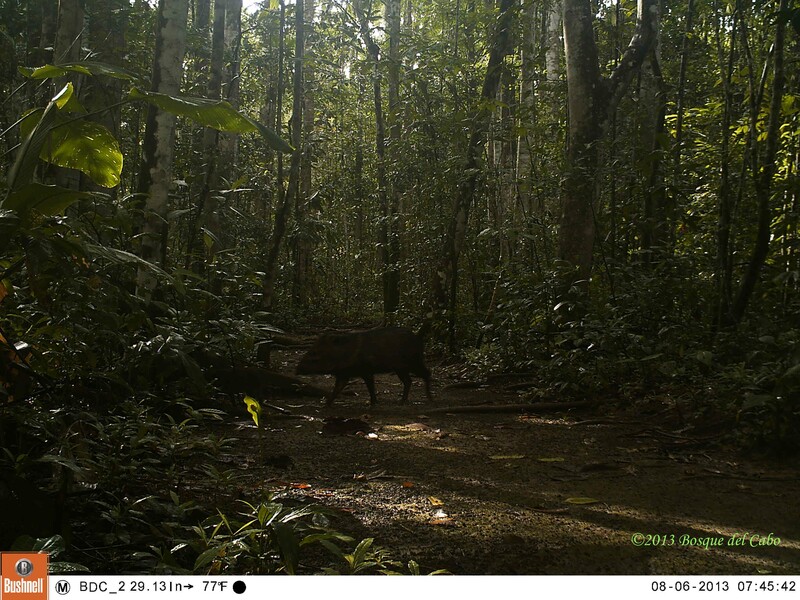 Another animal whose numbers appear to be on the increase are the Collared Peccaries, (Tayassu tajacu). 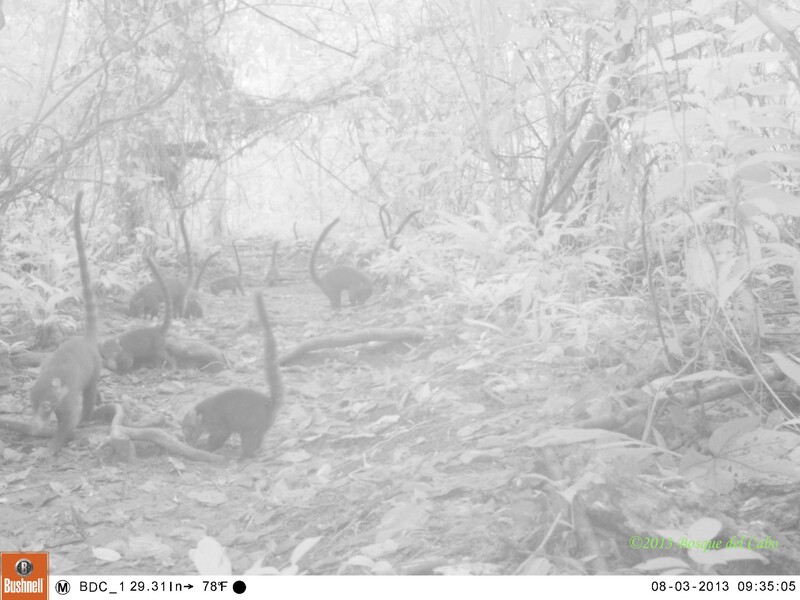 They can be seen on any of the trails but the Titi Trail seems to be their preferred habitat. 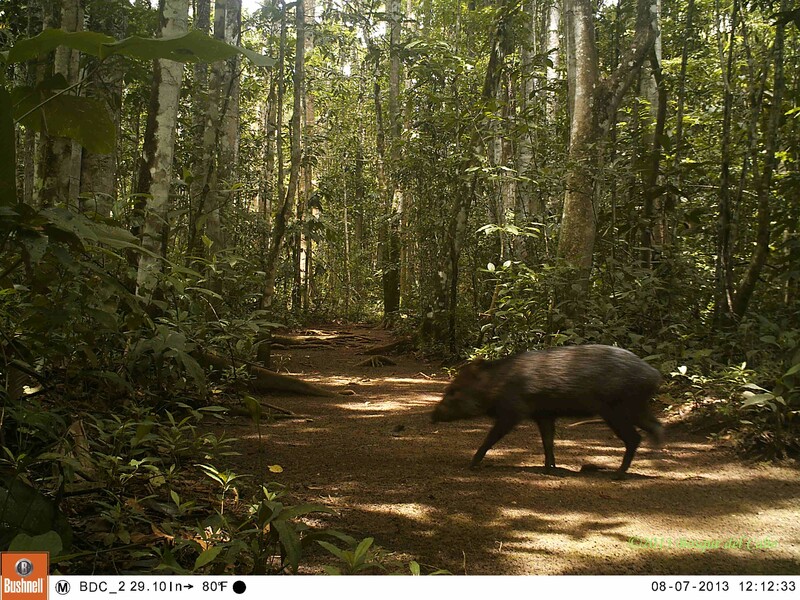 Everyone walking the Titi Trail will invariably come into contact with the peccaries. 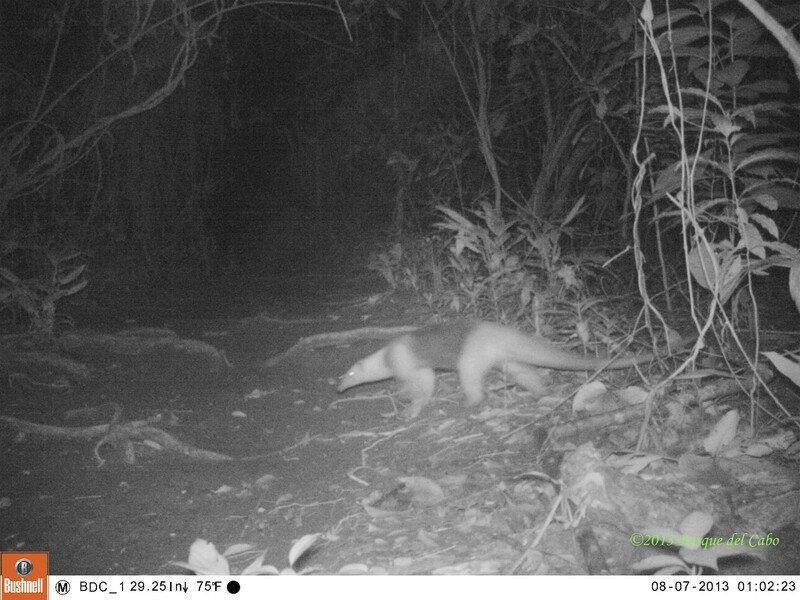 The Bosque Trail Camera Project has given us the opportunity of observe 24 hours/day, 7 days/week the animal movement at least on that one trail. Each week when the camera memory is downloaded there is an air of anticipation and excitement as to what will have passed by over the previous week. 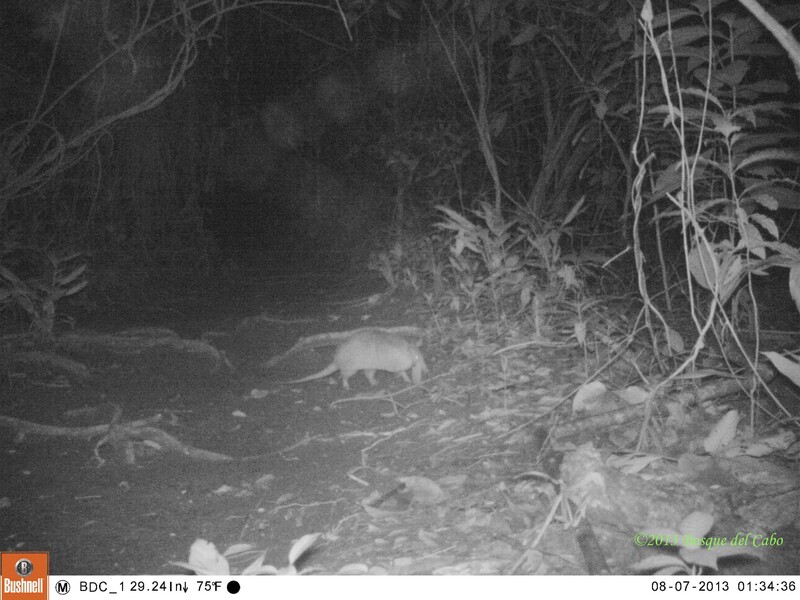 Inevitably it is the peccaries, coatis and the Agoutis, (Dasyprocta punctata), that take centre stage in regards to numbers and frequency with some lesser players in the weekly cycle of activity who taking up the supporting roles. 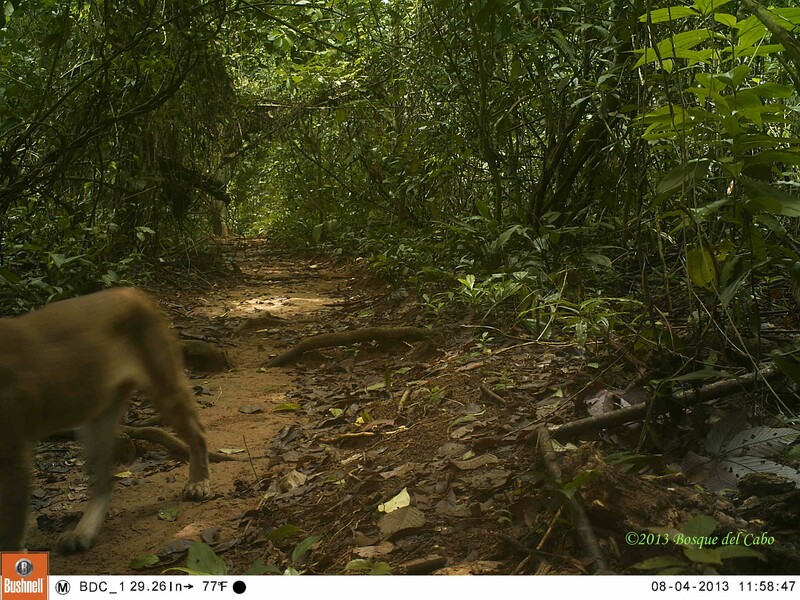 We did get our first photo of a Puma, (Puma concolor), this week on the Titi Trail. 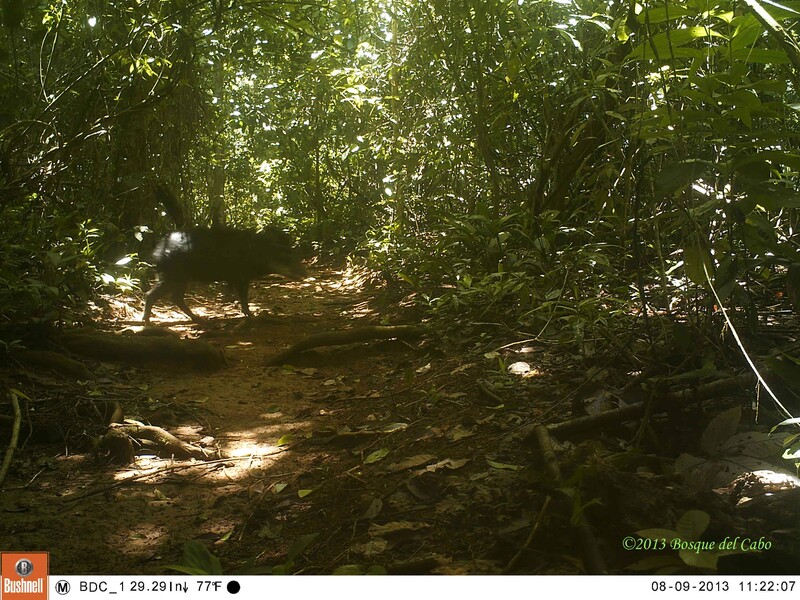 It will come as no surprise to regular readers of this blog that it looks like the resident and distinctive female “Half Tail” that walked through the cameras field of vision. Unfortunately she did so in such a fashion that she triggered the camera as she was passing and so we are missing her head. For reasons as yet unknown, wildcats have a predilection for the scent “Calvin Klein Obsession for Men”. To that effect the lodge has purchased a bottle of said perfume to spray in front of the cameras with a view of holding the cats attention for long enough that we get some photos with her head on her shoulders. The rain combined with constant warmth has resulted in a lot of the fungi producing fruiting bodies, mushrooms and toadstools. Some of the fungal fruiting bodies are so obscure that they resemble something more alien in form than most people are used to seeing Many times people don’t even know it is a fungus they are looking at. 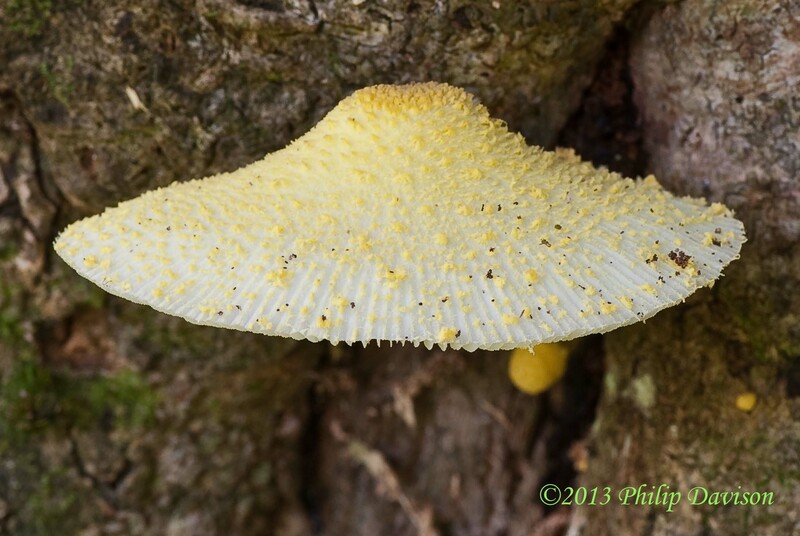 Then, of course, there are the more familiar parasol-shaped mushrooms that occur in all sizes and colors, many of which are diagnostic features in helping identify the specimen to species level. 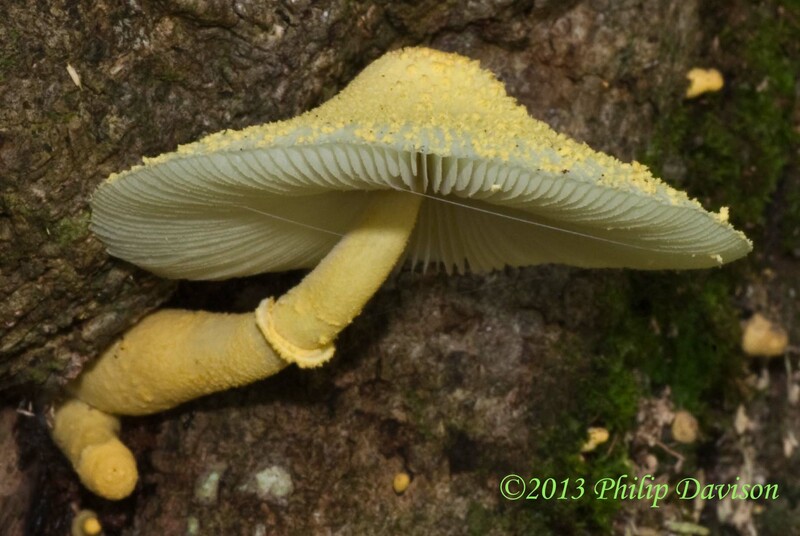 Growing saprophytically on the rotting wood of dead trees it is not uncommon to see the bright yellow granular caps of Leucocoprinus birnbaunii. It is found throughout tropical regions as well as growing in glasshouses in more temperate areas. It is quite surprising how many fungi know few boundaries and have a global distribution. Despite its resemblance to a marzipan cake decoration it is inedible and regarded by some authorities as deadly poisonous. As with many fungi it is always best to look and not touch. The rains have continued to fall so the frogs have continued to call. Last week I posted a photo of a Small-headed Frog, (Dendropsophus micracephalus). 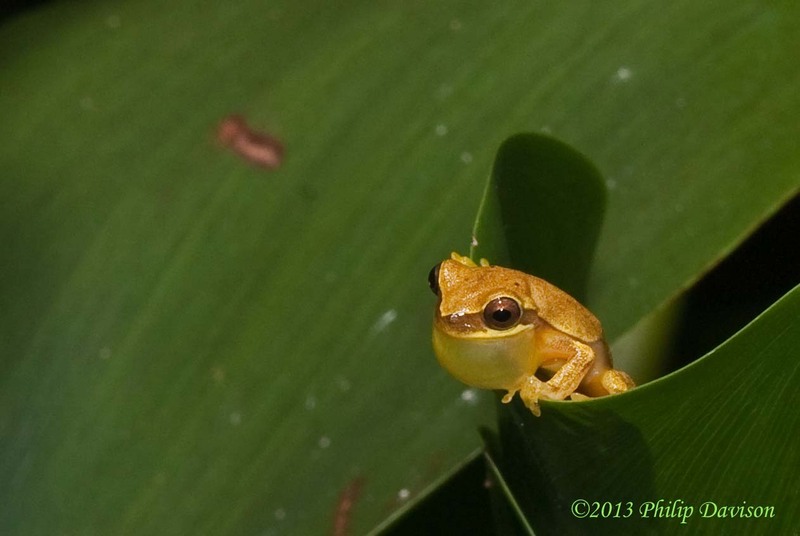 Located in the same area amongst the Water Hyacinth and Water Lettuce as well as all around the back of the pond is almost identical looking Banana Frog, (Dendropsophus ebreccatus). Morphologically the frogs can be distinguished with close scrutiny. The Small-headed Frog has a line running along the uppersides of the body while the Banana Frog has a small yellow patch under the eye. But it is when they are calling that the males can be readily discerned. The Small-headed Frog has a high pitched “eek eek eek eek” call while the male Banana Frog is more of a longer “neeurk”. Both species utilize the same areas to lay their eggs on the upper leaf surfaces of plants floating on the water. They are small flat masses of leaves numbering about 50 eggs. The eggs develop until about a week, the egg mass liquidizes and the tadpoles wriggle off into the water to complete their developement. Sometimes you witness aberrant animal behavior that allow you to identify that something outside of the norm in happening. 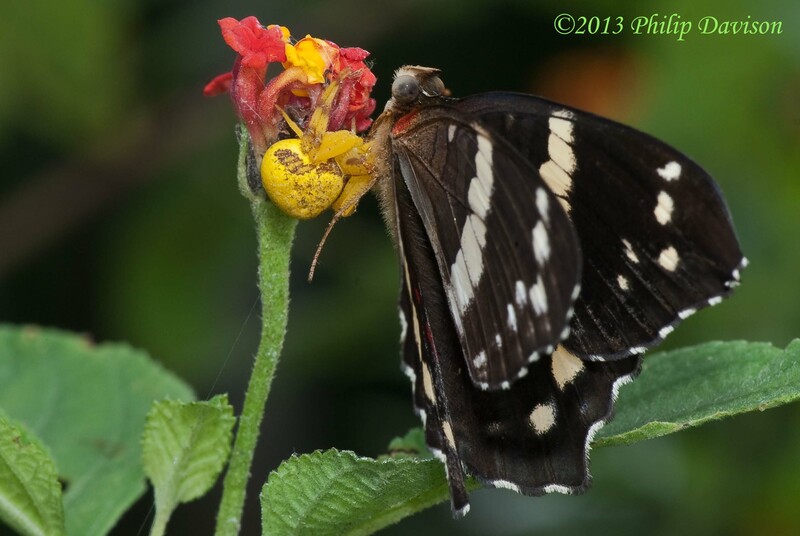 I was passing the patch of Lantana camara near the Bosque pond one day and was idly watching the butterflies that had been summoned by the sun. I noticed a butterfly that was resting on a flowerhead but at a strange angle and with no wing movement. Most of the other butterflies were warmed by the solar radiation and were flitting from one flower to the next, stopping only briefly to imbibe some of the nectar. This individual, a White-banded Fatima, (Anartia fatima), was not. I knew fron experience what was likely to have happened and luckily had the camera with me so took a closer look. 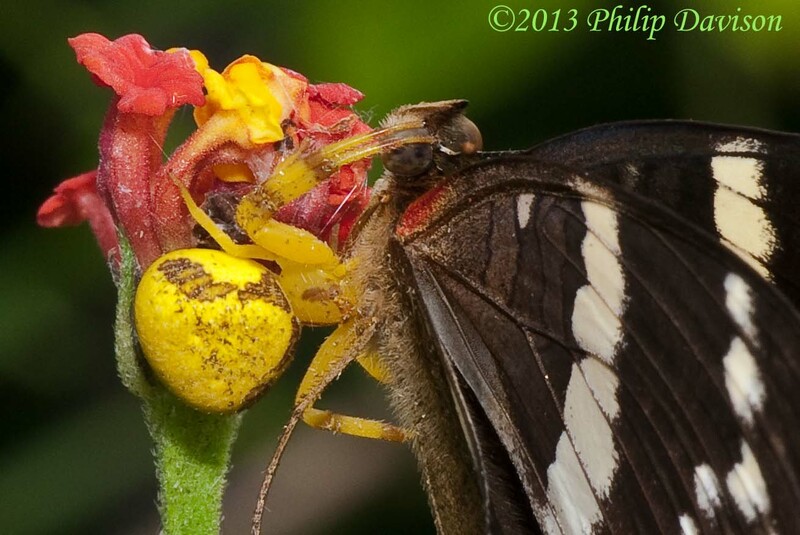 Sure enough my thoughts were confirmed, a beautiful Crab Spider was positioned at the top of the flower head, its chelicerae, (fangs), buried in the body of the butterfly which must have succumbed to the quick acting venom. Crab-spiders are placed in the arachnid family: Thomisidae and they are ambush predators that also the masters of disguise. This one had a body colored in a fashion to match exactly the flower in which it was lurking, bright yellow. Butterfly vision allows them to see color and movement but they don’t readily determine image. This unfortunate individual would not have know what hit it until too late. 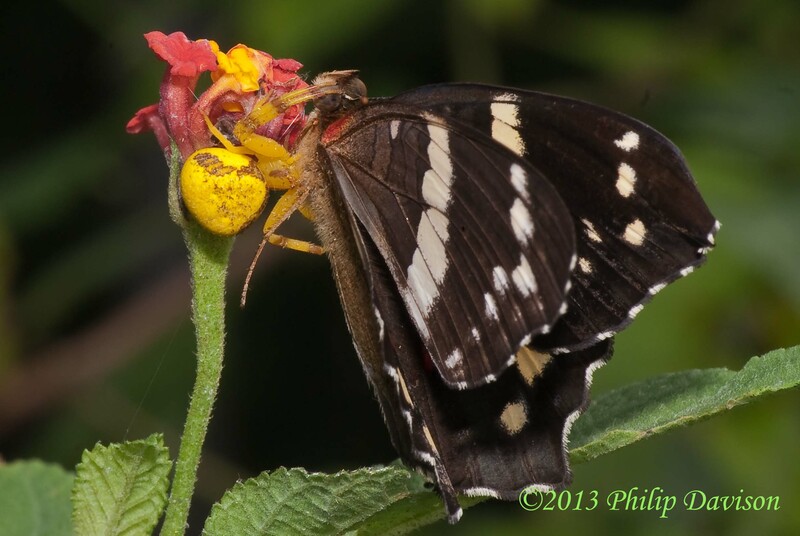 The Crab Spider unlike its butterfly prey which has large compound eyes has small simple eyes that only produce sharp vision up close but can discern movement from some distance away. They don’t build webs but use a silken line to secure them to the blooming flower. Female Crab Spiders can change their color to a certain degree to match them to the flower. They sit and wait with large strong front legs outstretched until the prey alights then grab it, hold it tight and inject the venom. The liquefied juices of the prey are sucked out of the puncture wounds. They attain their name of Crab Spider due to their uncanny ability to walk sideways. Highest Daily Temp 88°F. Lowest Daily Temp 74°F. Highest Daily Temp 31.1°C. Lowest Daily Temp 23.2°C.